Henderson Funeral Home has offered caring and dignified funeral services to the residents of the Pekin area for more than a century. In 1900, Orville W. Noel opened the doors to the funeral home, which was originally named Noel Funeral Home, at 412 Elizabeth Street in downtown Pekin. In 1939, Noel purchased the old "Rupert Park" estate, which occupied an entire square city block, and moved Noel Funeral Home into the 11-room Colonial style mansion. The stunning mansion was built in 1862 by Gideon Rupert, who was a pioneer settler and early businessman in Pekin and is credited with naming Tazewell County after Governor John Tazewell of Virginia. In 1964, Merl Henderson became the third owner of the funeral home and soon after included his family's name on the business - Noel-Henderson Funeral Home. Merl's wife, Linda, played an integral part in the business and, in a family tradition; Merl's sons George, Greg and Don all joined the family business as licensed funeral directors. Over 40 years later, the tradition continues with Greg Henderson and his wife, Marla, as the owners of Henderson Funeral Home. Adhering to the family values of compassion, integrity and trust, Greg and Marla are proud of the tradition of caring that has been a standard of Henderson Funeral Home for over 100 years. 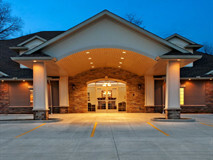 In April 2013 the funeral home was moved to its current state of the art facility located at 2131 Velde Dr. Pekin. The new 9200 sq. ft. facility includes a 350 seat chapel that be divided into three smaller chapels. It was designed with over 100 well lighted convenient parking spaces onsite. Also a dining area with kitchenette for family use during visitations or catered luncheons. There is a difference between “cremation services” and “on-site cremation services. We are the only Pekin funeral home that offers a crematory within our new, state of the art facility so that your loved one never leaves our care. You will always have the peace of mind, knowing that we are caring for your loved one until they are returned to you or placed in final rest. Henderson Funeral Home & Crematory is a member by invitation of the Selected Independent Funeral Homes. For more information about this organization and more funeral information please visit their website by clicking here. Greg Henderson, the owner of Henderson Funeral Home & Crematory, takes pride in the family tradition that has made Henderson Funeral Home & Crematory what it is today. While preserving many of the things that have brought families back to Henderson Funeral Home & Crematory Home time and time again, Greg has also implemented new ideas to help the community. Through Greg's guidance Henderson Funeral Home has received the National Funeral Directors Association (NFDA) Pursuit of Excellence Eagle Award. This mark of excellence honors firms for their outstanding community service, professional integrity and dynamic public relations programs. The Academy of Professional Funeral Service Practice has awarded Greg the designation of Certified Funeral Service Provider, and has earned the designation of Certified Crematory Operator by the National Funeral Directors Association. He has also initiated a series of grief seminars for the community hosted by nationally renowned grief specialist Alan Wolfelt, Ph.D.
Greg has also attended seminars at the Center for Loss in Fort Collins, CO. These seminars were Funeral Service Enrichment Experience, Helping Children and Adolescents Cope with Grief and Comprehensive Bereavement Skills Training. He is working towards his certificate in Death and Grief Studies from Colorado State University. Greg graduated from Worsham College of Mortuary Science in 1980 and received his Funeral Director's license in 1981. Greg is a member, past president and treasurer of St. Paul United Church of Christ in Pekin. He also was named a Paul Harris Fellow by the Pekin Rotary Club in 1996 and is a past president of that organization. Additionally, Greg is the President Elect of the Illinois Funeral Directors Association. a member the Pekin Area Chamber Commerce and past director on its board, past chairman of the Pekin Marigold Festival Committee, Chairman of the Salvation Army Advisory Board, Past President of IFDA District #8, as well as a member of Pekin Elks Lodge #1271. Greg is also involved with St. Jude, has been a VIP for the Central Illinois telethon, 10 year veteran of the Memphis to Peoria run for St. Jude. Greg resides in Pekin with his wife, Marla. They have three children, son Ryan, and daughters, Lauren (Justin) Phillips, Mallory (Cody) Henderson-Morris and grandchildren, Brayden, Alexis, and Maddison Phillips and, Ryker Morris. Marla Henderson, is from the Manito-Springlake area. She is the youngest daughter of Marlowe and Alice Caulkins. Marla received her life insurance license through the State of Illinois and has earned the National Funeral Directors Association's Certified Preplanning Consultant designation. She has received training for preplanning through the Academy Of Advance Funeral Planning. Marla has also attended Alan Wolfelt's seminar at the Center For Loss in Colorado on Creating a Meaningful Funeral. Marla is a member of St. Paul United Church of Christ, Pekin Hospital League, Past Co-chairperson of the Pekin Hospital Foundation Ball, Pekin Sunset Kiwanis Club member, Pekin Women's Club and a Member of the P.E.O. Sisterhood. Marla is also involved with St. Jude and was part of the "A Toast for the St. Jude Kids" committee. Marla resides in Pekin with her husband, Greg. They have three children, son Ryan, and daughters, Lauren (Justin) Phillips, Mallory (Cody) Henderson-Morris and grandchildren, Brayden, Alexis, and Maddison Phillips and, Ryker Morris. David has been with the Henderson Team since 2013. Dave earned his degree in Mortuary Science from Carl Sandburg College, graduating with highest honors. He received his life insurance license through the State of Illinois and has earned the National Funeral Directors Association's, designation of Certified Pre-planning Consultant and Certified Crematory Operator. Dave also handles the technology related operations at the funeral home including producing tribute videos, running audio during services and maintaining our computer systems. Dave and his wife Anna were married in 1988 and have two daughters, Danie and Allie. He is active in several ministries at Saint Joseph Church and is a Fourth Degree Knight of Columbus. Dave finds the greatest reward in assisting families in their time of need and participating in the Corporal Work of Mercy of burying the dead. Mallory Henderson-Morris officially joined the Henderson Team in 2016, but as Greg and Marla’s daughter, she has been involved with the family business in one way or another all her life. Mallory, her husband, Cody Morris, and their son, Ryker, live in Pekin and are members of Pekin First Nazarene Church. She is also a member of the American Legion Auxiliary and Pekin Womens Club. She is currently continuing her education while working at the funeral home. Mallory is a Mortuary Science Student at Carl Sandburg College in Galesburg and will graduate in May of 2019. She enjoys balancing being a wife, mother, and student while gaining practical experience in the day-to-day operations of the funeral home. When Mallory is not serving families, she enjoys spending time with her husband and son, and traveling. began his career in funeral service as an after hour attendant during high school. the Illinois Funeral Directors Association District #8. George is a member of the Immaculate Conception Catholic Parish in Manito. daughters Christine and Julie and grandparents of Maxwell and Maya Wiley, and Carson Ranney. John started working with the Henderson family in November, of 2006. He has found his place here to be very rewarding, in that he helps care for families in their time of need. John is a graduate of Springfield High School, class of 1968, and a graduate of Illinois State University, class of 1972. Many of you may know him from his work as a golf professional at Sunset Hills Golf Course in Pekin. Others may remember him from his 29 years of service as an employee of Cilco. He retired from there in June, of 2006, and came to Henderson Funeral Home just five months later. He and his wife, Althea, raised one daughter, Shireen, who is now married. John is a member of St. Joseph Catholic Church, in Pekin. Dan Heisel joined the Henderson Team in 2012. He retired in 2017 from the Pekin Fire Department last working as Assistant Chief after almost 30 years of service. Dan enjoys spending time outdoors, hunting, fishing, and wine making. Dan and his wife, Kathy, have two daughters, Jenna and Alissa and are members of St. John’s Lutheran Church. Dan appreciates the opportunity to greet friends and meet people who come to the funeral home for visitations and services. Deacon Ernie Whited has been a member of the Henderson Team since 2013. Ernie and his wife, Sandy have three daughters, Cathy, Laura and Sarah. Ernie is a Permanent Deacon for the Catholic Diocese of Peoria and is currently assigned to Saint Joseph Church in Pekin. Since his retirement from Caterpillar, Ernie enjoys spending time with his Grandchildren, attending their sporting events, traveling and learning about the American West. Deacon Ernie is pleased to assist families in their time of need. Deacon Mark is a 1987 graduate of Illinois State University with a Bachelor’s degree in Mass Communications. He was ordained as a Permanent Deacon in the Roman Catholic Diocese of Peoria in 2002, and is currently assigned to Saint Joseph Parish in Pekin, where he is involved in the RCIA program, Liturgy and Spirituality Committee and Prison Ministry. He joined the staff of Henderson Funeral Home in 2010.He finds assisting families during the loss of a loved one to be a spiritually rewarding experience. "Each situation has unique requirements and we work to exceed the expectations of every family we serve. Working for a family owned and operated business allows me to spend more time attending to the details that make their journey of loss a little easier. It’s this attention to detail and personalized service that a family remembers and will help them to carry on." His wife, Susan, and he are lifelong Pekin residents. They were married in 1988 and reside here in Pekin with otheir four children, Aaron, Daniel, David and Mary Bernadette. Joe Stubbs joined the Henderson Team in 2015. Joe retired from the Pekin fire department after 29 years of service to the Pekin area. Joe enjoys spending time outdoors, hunting, fishing, and gardening. Joe has one son, Blake. He is a member of First Baptist Church in Pekin, Joe appreciates the opportunity to greet friends and meet people who come to the funeral home for visitations and services. Dale Noyes joined the Henderson Team as a Funeral Assistant in 2015. Dale is retired after 30 years in the construction industry and currently owns and operates D&M Enterprises, a local lawn care service. He serves as an usher, lector and Extraordinary Minister of Holy Communion at Saint Joseph Parish and is active in the Knights of Columbus. His interests include NASCAR Racing and sports. Dale and his wife, Mary Jo, live in Pekin. They have two grown daughters, Stephanie (Noyes) Davis and Jennifer (Noyes) Larimore. Steve joined the Henderson team in 2016 as a funeral assistant. He previously worked as a manager for the past 35 years, most recently with American Rental Center. Steve is a member of St. Joseph Catholic Church, St. Joseph Catholic Church Choir, and serves as a Cantor. He is a former member of the Pekin Civic Chorus and Peoria Area Civic Chorale. Steve has an outstanding voice and enjoys singing. He often serves funerals and weddings as a choir member and special soloist. Steve enjoys being of service to families in difficult times, and brings his caring music ministry to each service he is invited. He strongly believes that we should comfort each other in many ways, and his calling is to present a message to families in song, to help in celebrating the life of their loved one and to walk alongside them in their grieving journey. Steve lives in Pekin with his wife, Lorgia. He has five children and 4 grandchildren. Gene Singley joined the Henderson Team in 2014. He spent 11 ½ years at John Deere as a Parts Manager and 31 years in the Insurance Industry. Gene is a member of Saint Paul’s Lutheran Church in Manito. His interests include hunting, fishing, woodworking and singing Barbershop Music. Gene and his wife, Sue, live in Royal Colony Estates. They have two grown children, Jenny and Adam, and several grandchildren. Kevin Stark has been playing the organ at wedding, church and funeral services in Central Illinois for over 40 years. He joined the Henderson team in 1975. Kevin especially enjoys providing comfort to the families we serve by enriching the funeral service with music played on the Rodgers Pipe Augmented Organ at the funeral home. In addition to his work as a member of the the Henderson Team, Kevin owns and operates Will Harms Office Supplies and is the Director of Music at Saint Joseph Catholic Church in Pekin. Al is a native of Manito and formerly owned the Limback Funeral Homes in Manito, Mason City and San Jose. In 2005 he received his 40 year award as an Illinois Funeral Director. Following the sale of the funeral homes to Randy Maas in 1981 he moved to Colorado Springs where he owned an Entre’ Computer Center. In 1990, Al became a field representative for Federated Funeral Directors of America and resided in Des Moines, IA for18 years, retiring in 2008. Al and his wife, Kay, currently live in Lexington, South Carolina and have two married sons and two granddaughters. Retirement has given Al the flexibility to return to Illinois and care for the families he has served over the years. Al’s hobbies include woodworking, golf and being a handyman. Most important in his life are, God and family. "It’s a joy to come back to be with family and friends in Tazewell and Mason counties. It will be my privilege to serve you as part of the Henderson staff." Chuck started working with the Henderson family, in August,1999, after he retired from Keystone Steel and Wire Company, in Bartonville, Illinois. He enjoys helping families through a difficult time in their lives, and is a very big asset to the staff here at Henderson Funeral Home & Crematory. He wife Carol passed away in August 2015, and together they raised a daughter, Michelle, and granddaughter, Kristine. Their son, Michael passed away on April 25th, 2005. They enjoy the company of their grandchildren and great grandchildren, as well as their activities in the St. Paul United Church of Christ. Chuck is a member of the Church Men's Brotherhood, and the Choir. He has also served on several Church Committees.